In their role as climate change canaries, clouds are both more prevalent and closer to home than Arctic ice-caps or polar bears. Cloud patterns have long been read as short-range weather indicators, but more recently they have begun to be seen as longer term climatic signals. Their messages are far from clear, however, and so far little is certain about the roles that clouds are likely to play in shaping future conditions on earth. Will clouds turn out to be agents of warming, veiling us in an ever-thickening greenhouse of emissions, or will they end up saving the day by reflecting ever more sunlight back into space? These, it turns out, are far from simple questions, and cloud behaviour continues to offer serious impediments to understanding future climates, since a change in almost any aspect of clouds, such as their type, location, water content, longevity, altitude, particle size and overall shape, changes the degree to which clouds will serve to warm or cool the earth. As is so often the case with climate science, research yields apparently contradictory results. On the one hand, for example, many climate scientists believe that continued surface warming will cause increased water vapour to rise from the oceans, leading to an overall increase in cloud formation — while on the other hand, particularly in warmer latitudes, an increase in the water vapour content of our atmosphere could see large convective cumuliform clouds building up and raining out far quicker than they do at present, thereby leading to a net decrease in the earth’s total cloud cover. Low-level stratiform clouds, meanwhile, tend to shield the earth from incoming solar radiation, but recent research has shown that such clouds are more likely to dissipate in warmer conditions, thus allowing the oceans to heat up further, and causing yet further stratiform cloud loss. Scientists currently have no idea which of these outcomes is the most likely, nor do they really know the kind of long-term influences that either is likely to have. Even if, for the sake of argument, it’s assumed that overall cloud cover will increase as the surface of our planet continues to warm, it remains unclear what kind of clouds (and thus what kind of feedback mechanisms) are likely to predominate. For instance, high, thin clouds, such as cirrostratus, tend to have an overall warming effect, as they admit shortwave solar radiation in from above, while bouncing longwave back-radiation (reflected from the sunlit ground) back down to earth. Any increase in cirrostratus cloud cover would therefore add another warming mechanism to our climate. In contrast, however, bright, dense cumulus clouds serve to cool the earth by reflecting incoming sunlight back into space by day. At night, these same clouds tend to exert a slight warming effect, by absorbing or reflecting back-radiation, but their overall influence is a cooling one, especially when their summits grow dense and white. So, in theory, an increase in high, thin clouds would amplify the global warming effect, while an increase in low, dense, puffy clouds would have a contrary cooling effect — which is why cloud-whitening has recently been advanced as a geo-engineering idea for mitigating the effects of climate change, with salt water to be sprayed from thousands of ships in order to create brighter and more reflective clouds over the oceans. In reality, of course, things are never that simple, and clouds have always had an interesting habit of behaving in unpredictable ways. 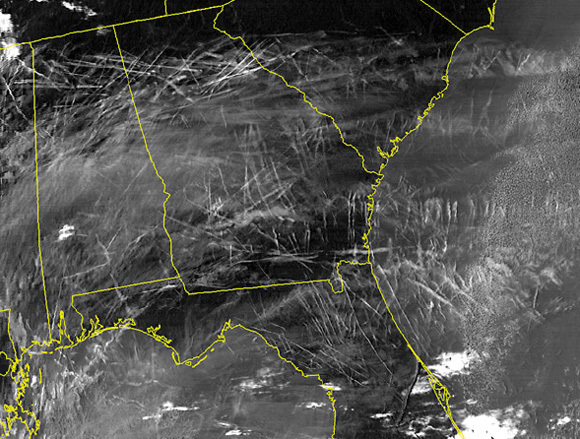 For example, after the terrorist attacks of 11 September 2001, all commercial flights in the United States were grounded for several days, leaving the skies contrail-free for the first time in decades. The result, according to a comparison of nationwide temperature records, was slightly warmer days and slightly cooler nights than were usual for that time of year, the normal night/day temperature range having increased by 1.1 degrees C. According to the climate scientists who worked on the data, this was probably due to additional sunlight reaching the surface by day, and additional radiation escaping at night through the unusually cloudless skies. At first sight this might seem counter-intuitive, for surely the kind of cirriform clouds created by the spreading of aircraft contrails are straightforward warming clouds, the kind that allow sunlight through, while bouncing back-radiation down to the lower atmosphere? Surely an absence of contrails ought to have an overall cooling effect? But contrails are a lot more complicated than that, because when they are in their initial, water droplet, stage they are denser than natural cirrus clouds, since they are created from two distinct sources of vapour: the moisture emitted by the aircraft’s exhaust, and the moisture already in the atmosphere, all of which is condensed into a turbulent mixture of large water droplets and ice crystals, seeded on the solid particulates present in the exhaust plume. At first, this young contrail behaves more like a fluffy low-level cloud, reflecting sunlight back into space, and exerting a short-term localized cooling effect. But if persistent contrails start to spread, they thin out into cirriform cloud layers, which can often cover large areas of sky. Their overall effect then reverts to a warming one, consistent with the known behaviour of natural cirriform clouds. 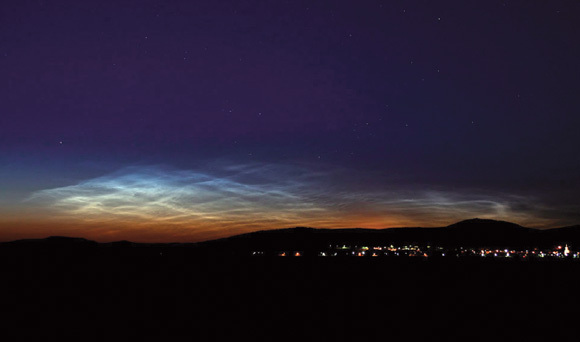 Equally up in the air, albeit at a far greater distance, are noctilucent clouds (NLCs), the changing patterns of which have become apparent over the past two decades. First observed and named in the 1880s, NLCs were once the rarest clouds of all, but not only are they now appearing far more often, they also shine brighter than they did before, and are observable from increasingly lower latitudes. According to one hypothesis, NLCs are being formed from plumes of space shuttle exhaust jettisoned into the earth’s upper atmosphere, where neither water vapour nor dust nuclei are common natural occurrences, and therefore these clouds’ increased appearance (an increase of 8 percent per decade) is due to a proportionate increase in space shuttle traffic. Other research, however, points to the fact that extreme cold is needed to form icy clouds in environments as dry as the mesosphere, 50 to 80 kilometres above the earth’s surface, where temperatures as low as -130 degrees C are normal. Strange as it may seem, the increased concentrations of atmospheric greenhouse gases that have contributed to raising temperatures on earth are also serving to create colder conditions in the earth’s outer atmosphere. This is because greenhouse gases trap much of the longwave surface radiation that has started its return journey back out into space. With less thermal energy able to escape from the lower atmosphere, the upper atmosphere is thereby growing correspondingly chillier. So could the observed increase in noctilucent cloud formation be due to mesospheric cooling, the lesser-known counterpart to global surface warming; and might their increased brightness be due to larger ice crystals being formed from a high-altitude influx of water vapour from the warming layers below? After all, NLCs have only been in evidence since the 1880s, the heyday of the Industrial Revolution, so it is possible that they will turn out to be yet another anthropogenic phenomenon — if so, the visible impact of human activity will have extended much further into our fragile atmosphere than we could ever have previously suspected. Whatever the secrets of these mysterious clouds, it is hoped that the AIM (Aeronomy of Ice in the Mesosphere) satellite, which was launched by NASA in April 2007 on a mission to study NLCs at close range, will be able to provide some answers to these questions. Viewed from ground level, clouds are short-lived localized phenomena, undergoing rapid alterations as they pass overhead; when viewed from space, however, their individual movements are subsumed into large-scale formations that range slowly across the earth’s surface, connecting vast tracts of land and sea through enormous geophysical processes. Seen from space, what from earth is merely an indistinct bank of stratocumulus cloud, becomes part of a visible planetary order. 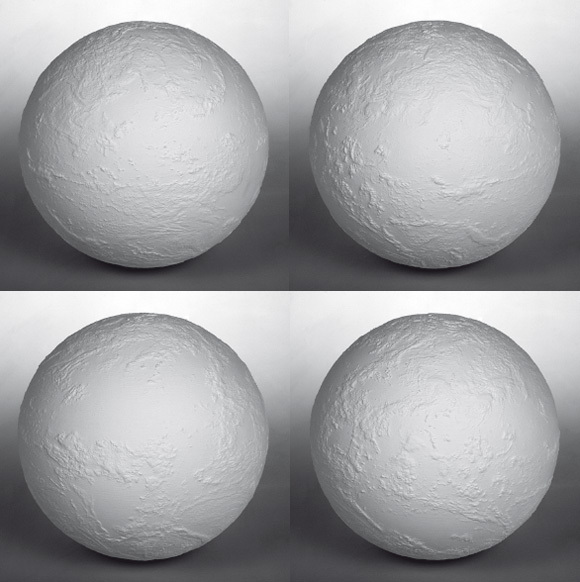 It was this dual perspective that led Martin John Callanan to produce a terrestrial cloud globe, entitledA Planetary Order, the many technical challenges of which were worked through and overcome during his residency at the UCL Environment Institute. ‘Unlike Richard, who’s got a huge fascination with clouds, I’m more interested in systems — systems that define how we live our lives’ (MJC). Showing the earth’s cloud cover from one second in time, the shimmering white cloud globe freeze-frames the entire operation of the global atmospheric regime, and highlights how fragile the environmental (and informational) systems are that operate across the world. For the globe is created from raw information, being a physical visualization of real-time scientific data. One second’s worth of readings from all six cloud-monitoring satellites that are currently overseen by NASA and the European Space Agency was transformed into a virtual 3-D computer model, which was ‘3-D drawn’, or rather, laser melted, at the Digital Manufacturing Centre at the UCL Bartlett Faculty of the Built Environment. It was the largest object ever created by the Digital Manufacturing Centre, and it took two full days to build, the delicate outlines and profiles of the clouds emerging slowly as the laser carved gently across the compacted nylon powder surface of the sphere. 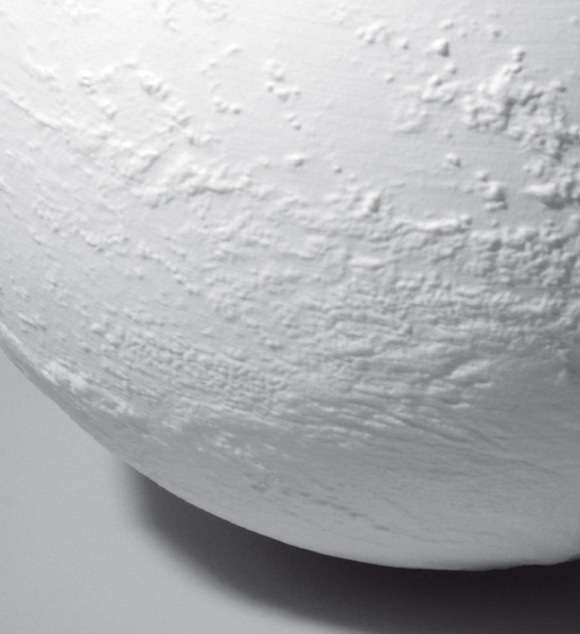 Unlike most of NASA’s own data visualizations, the globe features no added colour, only the sculpted whiteness of the raw material that throws a maze of faint shadows across the structure. From out of these shadows, in the right angles of light, emerge the global cloud patterns taken on 2 February 2009 at 0600 UTC precisely, and, under them, the implied outlines of the continents below, seen as though glimpsed through mist, or rather, through the mystifying quantity of atmospheric data that is currently being collected from the silent fleet of satellites in orbit some 36,000 kilometres out in space — an increasingly hertzian environment, where an electronic Babel of satellites, radio signals, text messages and security frequencies vibrate with an invisible stream of man-made weather. Though far from earth’s surface, we have nevertheless made it back to something resembling Borges’s 1:1 scale Map of the Empire, for, by taking a single second’s worth of transmitted information, our entire world has been made anew, pristine, white, and wreathed in the haze of an artificial atmosphere, held aloft like the fossilized egg of a long-extinct species that is about to be brought back to life from a single rescued strand of DNA. This Guest post by Martin John Callanan forms part of the discussion in the urbanTick series on Ecological Urbanism.